It is amazing how good the plastic version of a steel design classic can feel… you have to sit/lift this new 111 Navy Chair is! 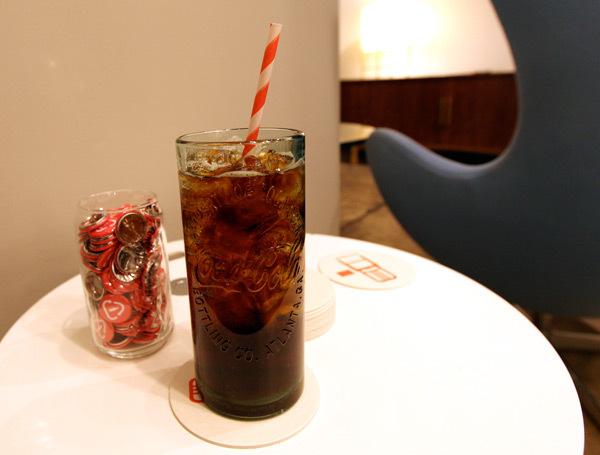 The Emeco classic remade in a special formulation of rPET (Recycled Polyethylene Terephthalate- recycled plastic bottles) mixed with glass fiber for strength ~ where each chair contains 111 recycled plastic Coke bottles! 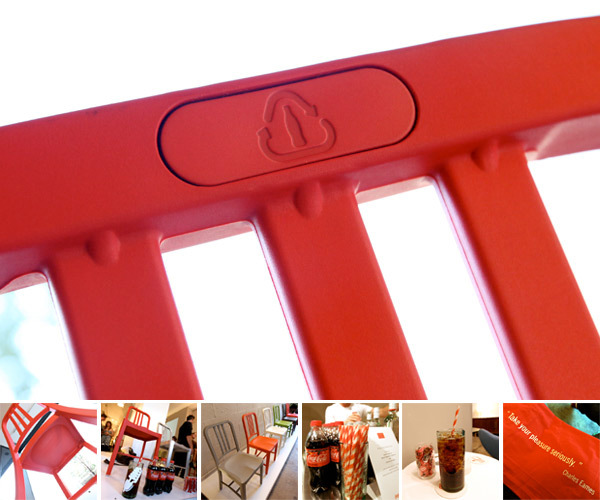 Apparently over the last 4 years ~ Coke instigated this project, challenging Emeco designers/manufacturers to adapt the chair. While this launched in milan (frozen in a block of ice! - see pic on next page!) 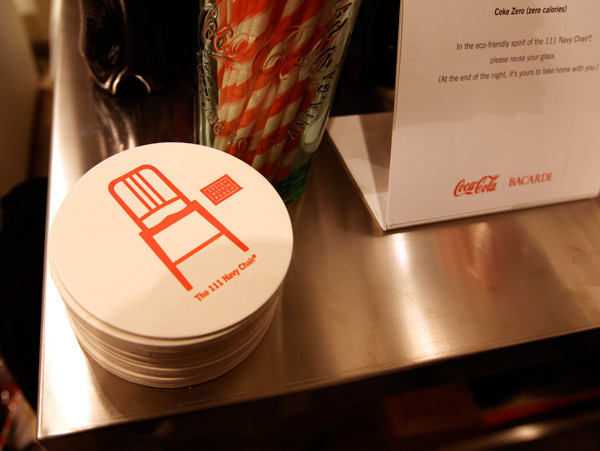 ~ the launch party for it at DWR NY in the meatpacking had so many fun design details, as well as lots of the chairs to sit on and play with ~ the experience had to be shared! 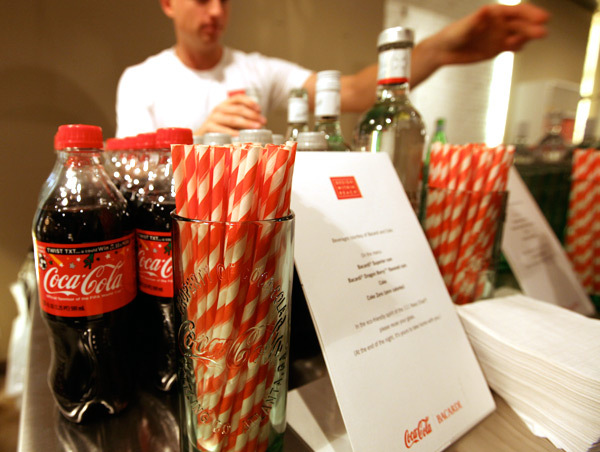 From recycled coke glass bottle tumblers filled with rum and coke and topped off with paper straws ~ to fun graphics on walls/male models in tees/port-a-potties/coasters/pins ~ to a photobooth! And adorable bags with the Eames quote “Take your pleasure seriously.” (Words i definitely live by for NOTCOT! )… so take a peek at all the fun on the next page! 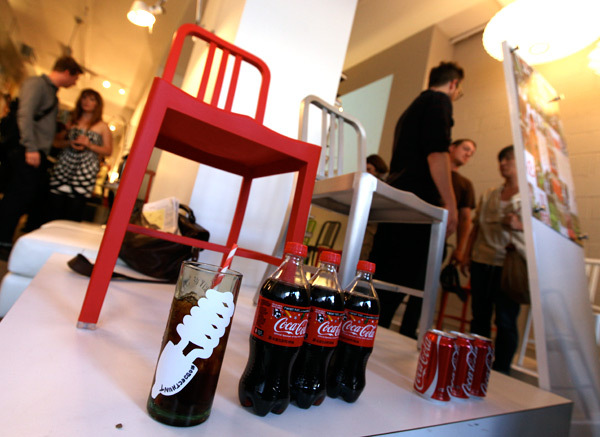 Just to do it chronologically ~ here’s a pic i dug up of the chair launching in an ice cube in milan! Now, on to the party in NY! 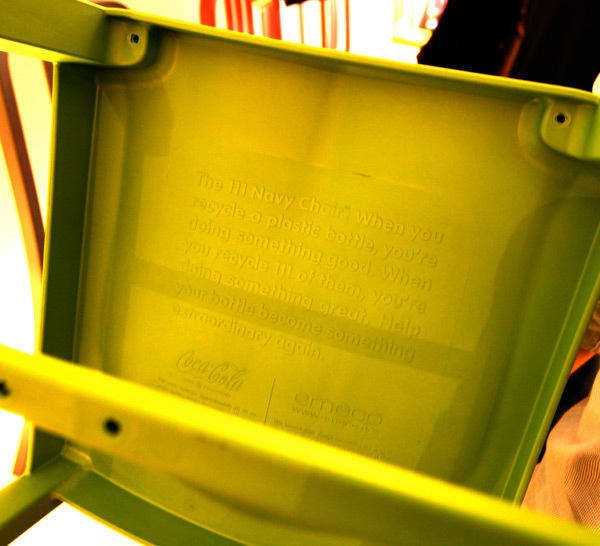 Love that with the plastic molding ~ they are able to include details like the full text on the underside of the seat explaining the background of the chair! 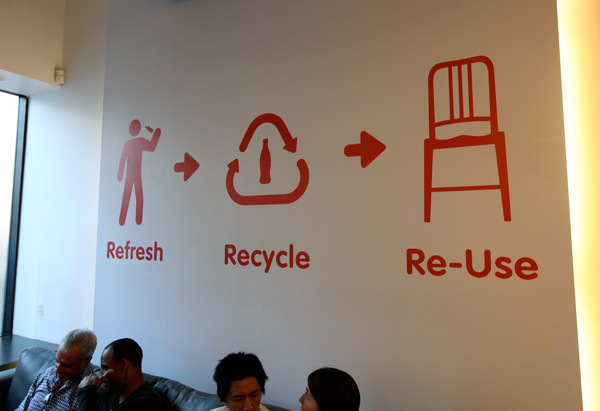 As the Emeco Navy Chair site explains: When you recycle a plastic bottle, you’re doing something good. 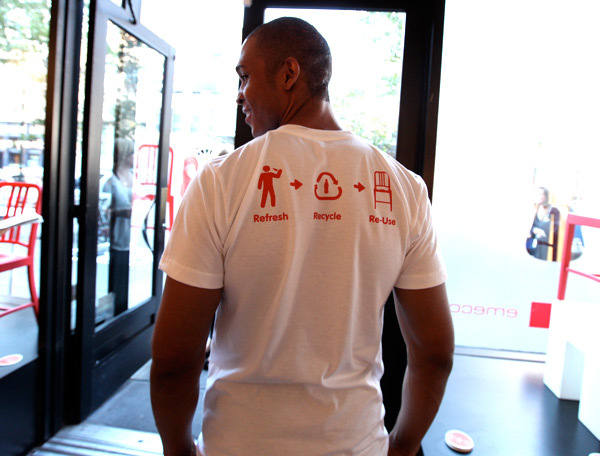 When you recycle 111 of them, you’re doing something great. 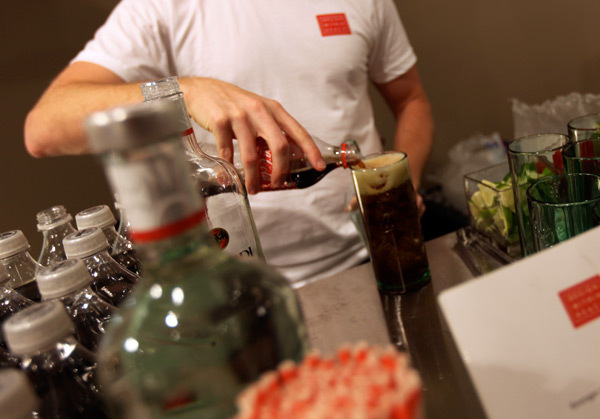 Help your bottle become something extraordinary again. 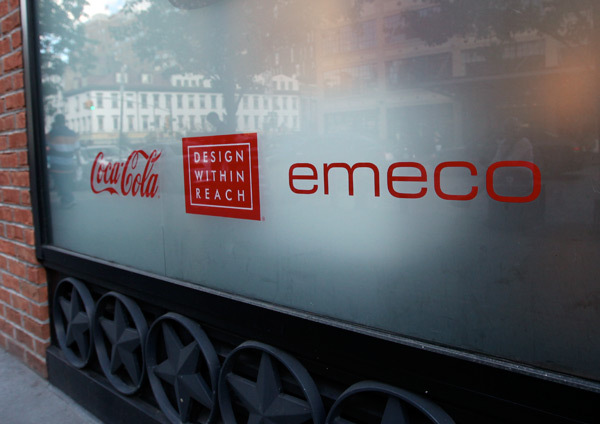 About four years ago, in 2006, Coca-Cola came to us at Emeco with a proposal. Their recycling plant in Spartanburg South Carolina was brand new and processing thousands of plastic bottles a day and they were looking for ways to show the value of recycled plastic. Everywhere else in the world people recycle about 80% of their bottles while in the US we recycled only about 20%. 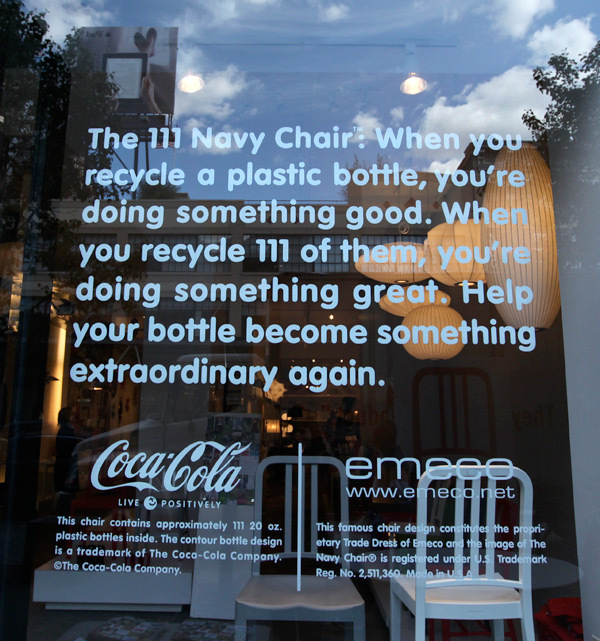 Coke asked us to make the classic Navy Chair out of a new, unproven formulation of rPET (Recycled Polyethylene Terephthalate- recycled plastic bottles). They introduced us to the scientists at BASF the international chemical innovator and together we developed proprietary mix made of about 60% and a special combination of pigment combined with glass fiber for strength. Requiring a state-of-art mold, the new 111 Navy Chair™ includes the original stretcher (structural brace) below the seat. This detail not only assures authenticity, but creates great structural integrity. The 111 Navy Chair™ carries a 5-Year structural guarantee. 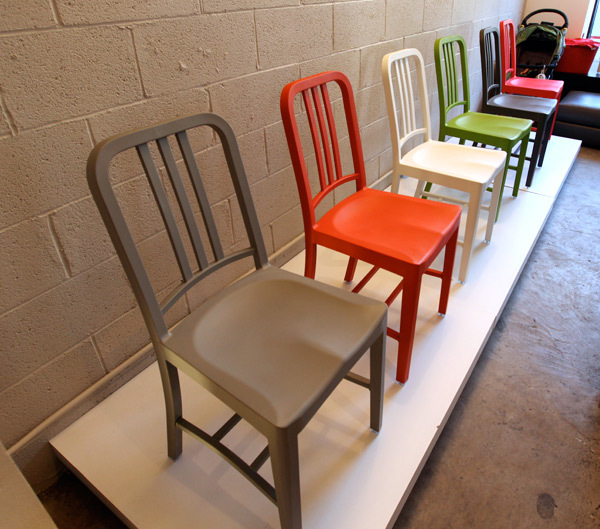 The new 111 Navy Chair™ is available in six colors: Red, Snow, Flint Gray, Grass Green, Persimmon and Charcoal. Snow, Flint and Red can be used outdoors. The new chair has a distinctive, “velvet” finish that is scratch resistant. The new chair passes California and UK Fire Codes, along with BIFMA structural testing for commercial use. 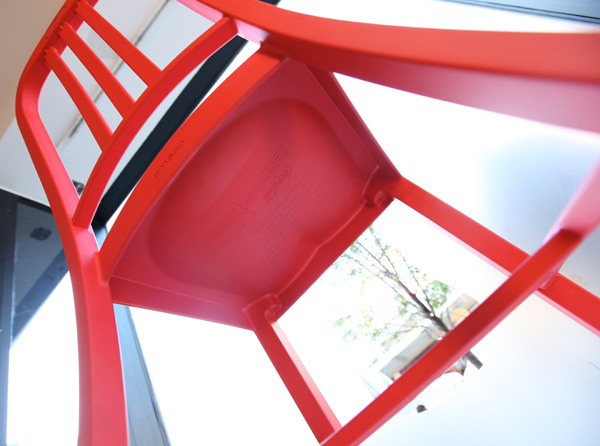 Replicating the original Navy Chair in recycled plastic required an advanced molding technique, and the expertise of Magnus Breitling, Emeco’s esteemed Director of Product Development. The gas assist process adds internal structure to the chair while minimizing the amount of material required. The chair body is manufactured upside down in a special core island while a robotic function inserts the stretcher into place while the chair is still hot. The entire mold runs at an elevated temperature to yield optimum surface appearance and color. 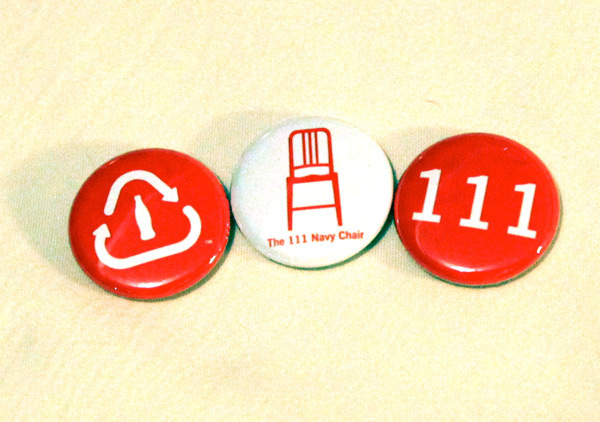 At three minutes per chair, It takes three times longer to make a 111 Navy Chair ® than a typical plastic chair. Engineering and tooling design began in 2008. In 2009 the “earth inspired” color palette was selected by Laura Guido-Clark, who has developed colors for HP, Samsung and Toyota among others. 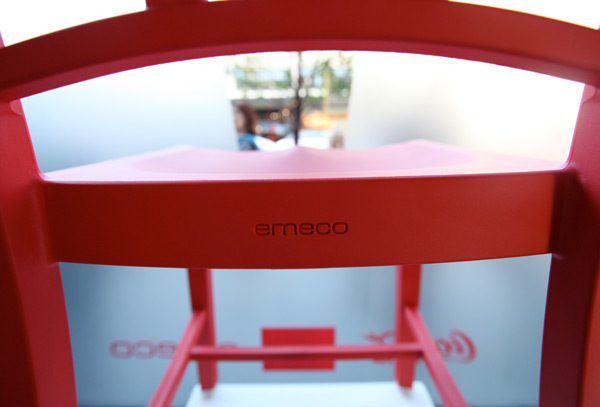 The first prototypes were molded in April of 2010. And ironically the party, all the paper goods, adverts, merch, that dumb block of ice, and all the other expended energy used to promote this party completely offsets any benefit from the recycling but also spits in the face of the very idea behind the chair. 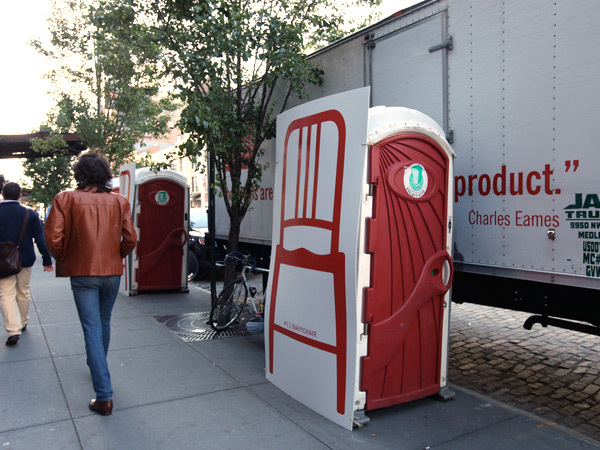 Oh fail environmentalism, how you do amuse. Jean, this is such a great post. Thanks for sharing! Also, this party will be followed by others in San Francisco, Atlanta, Portland, Austin and LA (www.111navychair.com). 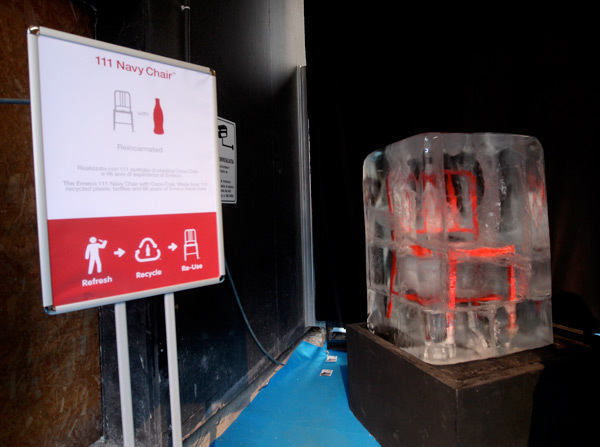 Why was a supposedly environmentally friendly chair placed in a block of ice? What’s the point in wasting electricity to make it ‘look good’. Surely this just goes against their sustainable reasoning? I don’t get it. 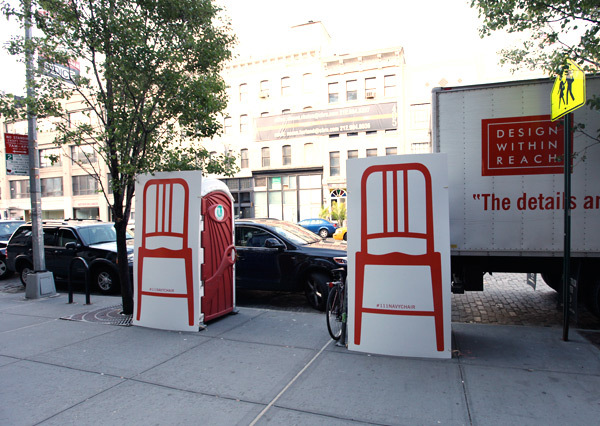 Love the chair and probably I’m gonna get a pair of the red ones. What I find intriguing, is that they keep the weld spots on the vertical bars on the back rest. I would’ve thought they could remove those prior to making the final mold… or maybe they are keeping it for added charm and character? Love it anyways!